As I get older, I grow younger. 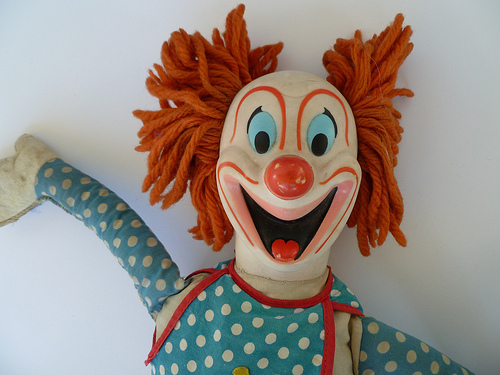 I find myself longing for our old pal Bozo the clown doll who is surely 30 years buried in a landfill. I want to hear his comforting words parroted back to me in his untroubled tones. I picture him in his aqua spotted clown tunic with his orange-yarn hair in clumps going east and west. With each pull of the string our Bozo belted out hilarious phrases one-after-another. “Keep on Laughing” and “Whoop-dee-do-dee-doodley-doo” were two of his favorites. Occasionally you’d hear a “Now that’s a ding dong dandy” or “I’m your old pal Bozo” as if we could ever forget our old pal Bozo. These were the glory days before screenwriters brought clown dolls to life to kill everyone in the neighborhood. With Bozo nestled between us at bedtime, my sister and I took turns pulling his string to hear his ever-cheerful chorus of spirited phrases. Now I find myself calling my dad looking for the same kind of encouragement. “Hi Dad. It’s Ann” I say into the phone. He says this every time, and sometimes I find it annoying, but today I pull the string wanting to hear what I know will come next. “I love you Dad,” I say. “I loved you first” he chimes back.